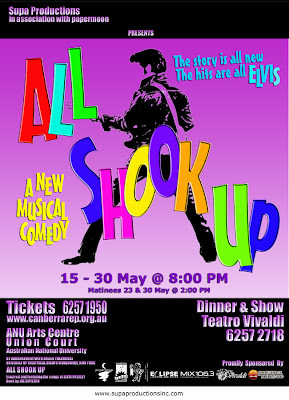 ALL SHOOK UP mixes a new musical comedy with a whole lot of The King, and guarantees that your entire family will be jumpin’ out of their blue suede shoes! The action is set in Smalltown, USA circa 1955. When “a rolling roustabout with a song in his soul and an eye for the ladies” rambles into town on his motorcycle, guitar slung over the leather jacket on his back, everyone eventually responds with new attitudes and welcome results. Just as in most lighthearted comedies, everyone falls under love’s spell, but in this production its with the “wrong” person. Dennis, the town nerd, loves grease monkey Natalie, who loves the roustabout, Chad, who’s fallen for the museum curator Miss Sandra, who’s a sucker for men bearing poetry, but not for Jim, the man who pines for her. It gets even more complicated, however, because—just like in Shakespeare’s Twelfth Night—there’s a character who undergoes some gender-bending in order to get close to the one she loves. Add to all that the changing cultural climate of 1950s America and you get “The best retro rock show since Grease” (NBC). Directed by RON DOWD who also directed The Wall for Supa; he joins CAT Award winners GARRICK SMITH (musical director) and JACQUI RICHARDS (choreographer) to present this fun filled music. And now the good news. We’ve got a double pass to opening night for a lucky premium member. Just email root@the-riotact.com before 5pm on Tuesday 12 May 2009 with your userid to be in the draw. Not already a premium member? It’s not too late to join.